My sweet Yula has been on edge ever since we moved into our new space last month. Very understandably, as there were two dogs living here before and their scents were everywhere. Luckily our latest heavy rains have likely washed away all the lingering outdoor scents and the indoor areas have had a few full deep cleanses. But we are also adjusting to new sounds, creaks in the wood, strange animal sounds in the night. So it has been taking a bit longer to get fully settled. Along with some Flower Remedies that I drop into her water, I have also begun using some essential oils to help ease her into this home and to lessen her anxiety a bit. I have also been using the soothing oils below in a diffuser so the both of us can breath them in and experience the benefits. ESSENTIAL OILS + YOUR PET :: Similar when used on us, essential oils can be a very effective tool for easing stress for your pet. 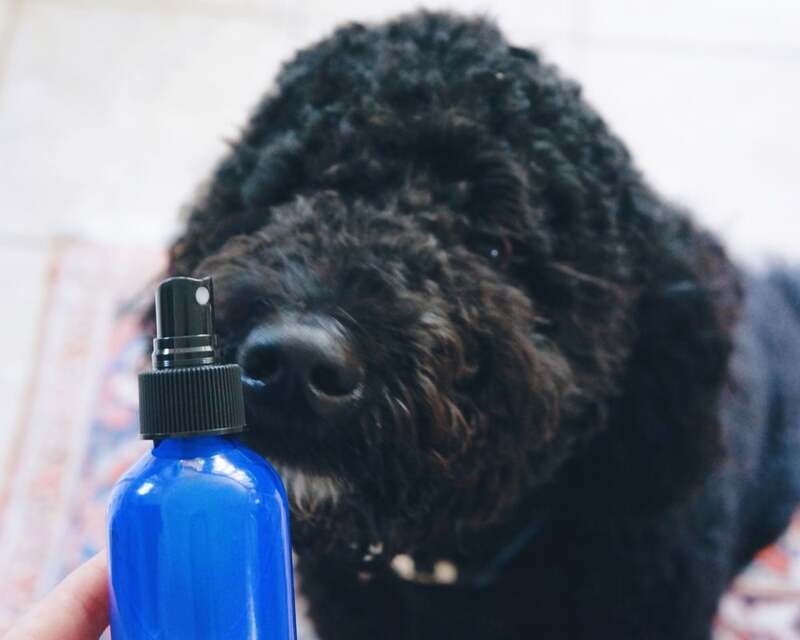 Simply by taking a drop of an organic calming blend and gently massaging it into their coat can bring some relief. I stay further away from her nose as dogs have such highly sensitive sniffers, but close enough for her to still get the therapeutic effects. This is a blend that I came up with and have found it really calming for her. Do be sure to use only organic brands as the purest oils will help to nourish your dog’s coat, leaving it shiny and clean. Combine in a dark glass spray bottle + shake. Store in a cool place and use as needed over coat.